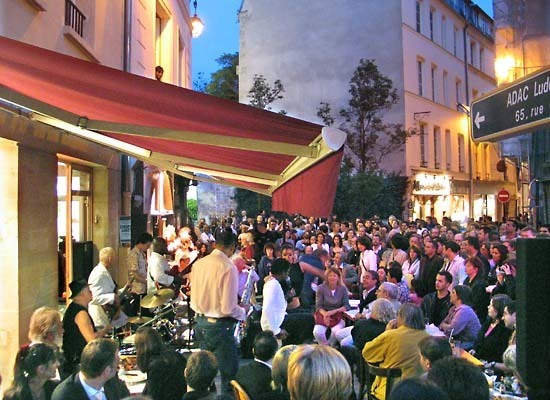 The "Fête de la Musique" is back in Paris. 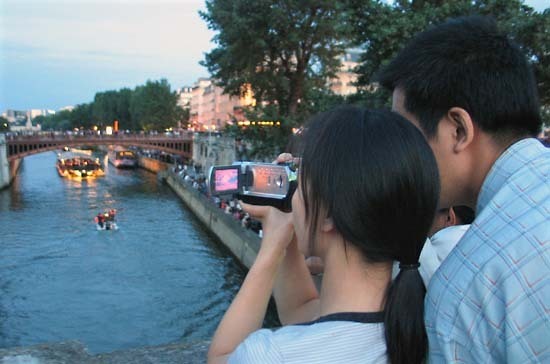 The longest day of the year is also the most vibrant of the year in the french capital, july 14th and New Year's Eve just can't near or compete with anything like this. Musicians can play all day wherever they want, be they professionals or mere amateurs. 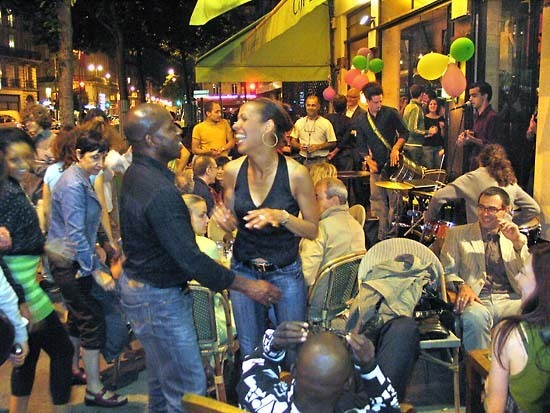 You can wander in any street and you will stumble on people playing music, singing and dancing. 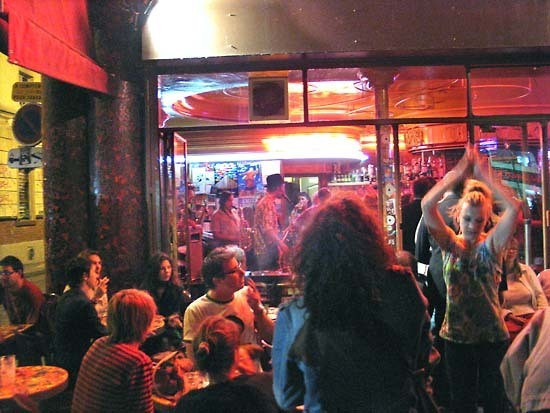 Many people choose to go to the major musical attractions which are usually listed in the newspapers, but they miss the real thing: the atmosphere in simple cafés and bars where musicians and patrons give a personal touch to the Fête. Here, in this bar of Belleville, the musicians (we can see the saxophone and the singer) play inside while people enjoy a glass and look as a woman magicly dances around the tables. 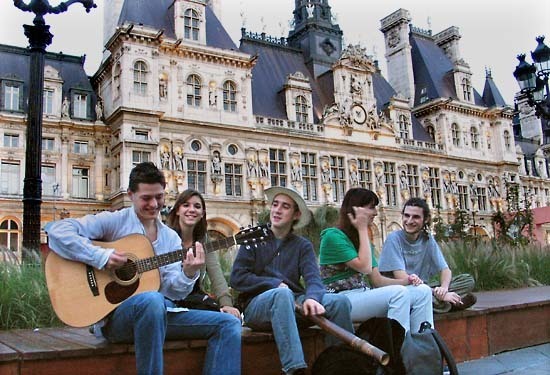 A crowd of out-of-town youngsters came in Paris that day, probably from the french provinces as school is basicly over, plus the tourists who know that this is THE DAY to be in Paris. The weather was perfect: clear sky and nice temperature, just cool enough to be able to move and dance and not melt. We walked in a few neighborhoods to feel the beat and this was a very good millesime. Some places and streets were pretty crowded. Never try to reach the heart of the city by car: By foot you will see much more, even unexpected things and scenes and musicians that are not listed anywhere of course. Beautiful music, from people I don't have a hint of who they are, but that's the way it is. Lots of blues and rock and the crowd loved it. I wished we could have swimmed closer, but from the side we saw it all. There was a woman there (black dress) who stealed the show with her spinning dance among the tables and musicians. Many of the teenagers had brought bottles of beer and wine, and were pretty smashed, but even then, kept relaxed, in an euphoric and sociable mood. I guess they celebrated the end of the school year. Here on this picture this is another, older generation, and the music was from the caribbean. This is not related to music, but I shot this picture that same night. 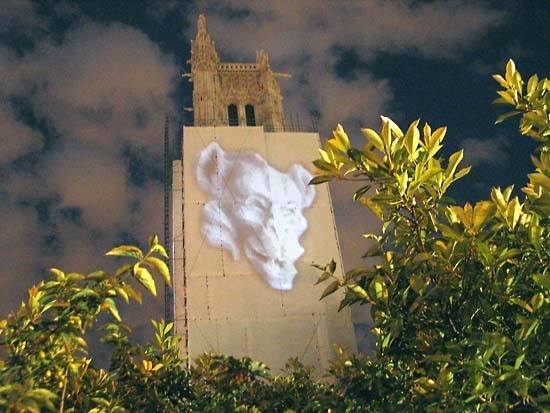 The Tour Saint Jacques is being restored and a permanent light show on the protective plastic made successive devil-like sculptures appear in the Paris night.